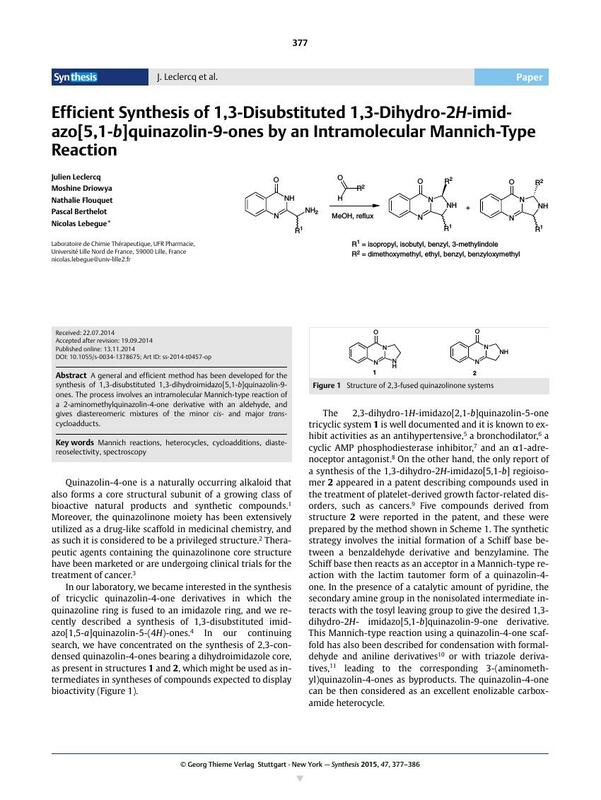 A general and efficient method has been developed for the synthesis of 1,3-disubstituted 1,3-dihydroimidazo[5,1-b]quinazolin-9-ones. The process involves an intramolecular Mannich­-type reaction of a 2-aminomethylquinazolin-4-one derivative with an aldehyde, and gives diastereomeric mixtures of the minor cis- and major trans-cycloadducts. for this article is available online at http://www.thieme-connect.com/products/ejournals/journal/ 10.1055/s-00000084. 3 Examples include raltitrexed (marketed as Tomudex for treatment of colorectal cancer), ispinesib (Phase II for solid tumors), and tempostatin (Phase II for bladder cancer). 14 See the experimental section and the Supporting Information for details.